Hillel says, “Do not judge your fellow until you have reached his place” (Sayings of the Fathers 2:4). The work of the Lean coach is to provide humble consulting, and that consultation will be evaluated according to the depth of trust he is able to form with his consultees. The Lean leader and coach must build a process that serves as the purpose of every lean enterprise: It is not the sale of products and services that is paramount, but rather the creation of partnership with the customers. As I wrote in a previous column, the purpose of the LNGA initiative is to design a process for the construction of a Lean Enterprise organization that is capable of coping with the challenges entailed in the development of a both a product and work processes in the context of a complex socio-economic, business and organizational environment. An empathic stance forms the foundation for the trust between the person to whom the value is addressed (the customer) and the coach, who is a partner in the journey towards change. In order to implement the purpose of the value package and to aid the customer in the dilemmas she faces, development teams must engage empathically and enter into an ongoing and interactive dialogue with the customer in his daily work environment. It’s easy to advise others; it’s harder to do these things yourself. 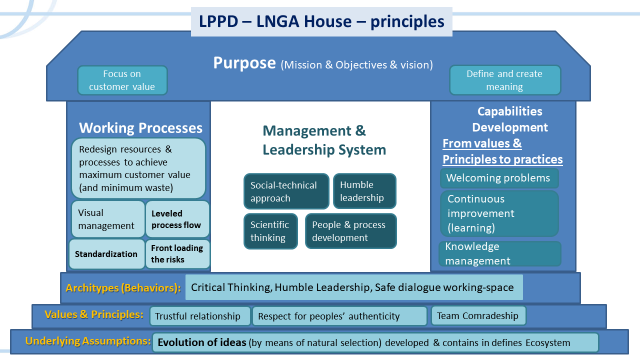 As a guide to change, the LNGA development team must implement both the principles of LLPD product development and the five dimensions of Lean Transformation Formula. In order to evaluate the “product” in the field (the standard of the facilitation as a Meta-Process), the team must the working principles in a dual process, which occurs simultaneously in two spaces – with the customer and within the team facilitating process. Development of a Standard of Facilitation According to the Five Dimensions of Lean Transformation Formula. The purpose of the development of the LNGA standard – “to create practical means and methods to lead organizational and social change”– provides an attractive vision, but any effort to turn to a broader market (and to use the Taylorism, modernist, methodology), rather than to a specific customer, is likely to merely lead to superficial understanding of the methodology of facilitation (principles and tools) and to standardization that ignores the unique needs of the target customers. The problem, in other words: How to disseminate a view of management throughout the world and replace Taylorism, without turning this alternative view into a dogmatic, rigid and repetitive view that, in the end, ignores the needs of the customer – the organization that is undergoing the Lean Transformation. Toyota has already proven that it is possible to maintain a huge organization that carefully trains its staff to be high-quality, thinking, knowledge-workers. During the development stage, experiments are conducted with a small viable market (SVM), which enables them to examine the minimal viable product (MVP) while creating different models designed for different situations, thus generating a process of training for change leaders that teaches them how to choose the proper tool and adapt it to the field. In an organization that operates according to Taylorism principles, knowledge is power that is wielded only by the chosen few, and that power confers authority. In a Lean enterprise, knowledge is created together and its power is conferred to the users who need it for their work. In International Lean Enterprise (ILE) team work, we have learned that it is possible to coordinate a team made up of a variety of professionals, diverse nationalities and cultures without defining controlling power or supervision. A high level of trust among the members of the team makes it possible to transform the legal term, Copy Rights, into open code rights, under the slogan – Please copy, but do it right! Our experiential arena is composed of the organizations with whom we are in a relationship of facilitation and support along their journey towards a Lean transformation. The development of the “product” through experience in the field demands that the facilitation team deals with the difficulties and risks facing anyone who seeks to develop a product according to LPPD. The parallel dual process demands that we not only understand the importance of empathic observation of the ways and needs of the customer, but also that we experience these in real terms. The division of labor among the members of ILE team is not determined by a superior authority, since there is no such formal authority, but rather according the ownership of the learning and development of the tool or the method and its evaluation by each and every member of the team. This team work plan is defined on the basis of the Committed-Log Tasks and Post-sticks pasted next to teach task signify a specific owner’s commitment to make a significant effort to support the development process. 4. Enhancing the capacity to solve problems according to scientific thinking. In organizations managed according to traditional principles, managers are responsible for solving problems. In a Lean enterprise, as with the development team, we seek to design a problem-solving culture as a pattern that permeates the length and breadth of the organization. Ground breaking innovations and ideas can occur in unexpected places. For example, in during a Lean transformation, each and every one of the members of ILE team involved in a process of change with his customers shares what she has learned from every sketch, idea, method or training module. Solutions tailored to the size, needs, and ways in which the customer uses the product, irrespective of his ethnicity, nationality, or industry, are examined in real time in an interactive PDCA cycles. Finally, as we have encouraged our customers to develop the values and qualities of a leaning organization that redefines managers as Humble Leaders who guide and create capacity, with the managerial team serving as first among equals, or the Team of Teams, so an open, probing dialogue forms part of the foundations of the team developing the LNGA standard – both with regard to organizational learning as well as with regard to the way in which we manage ourselves. The authority of the leader of the process of product development stems solely from the fact that he took upon himself the responsibility to mentor others according the knowledge he has acquired. Forgoing hierarchical structure enables the construction of an Ecosystem for fresh ideas, critical thinking, and a culture of dynamic and exciting discussion, which can be referred to as the “Evolution of Ideas.” This is a process of transformation from individual innovation to group creativity based on the wisdom of the many and shared knowledge and learning. The vision of the LNGA standard can be achieved through openness to the public and by transforming the community of users into a global learning and sharing community, after examining at each point, together with the shared targeted customers (SVM) in the development process. Through this process, in which the variety of professionals and national and cultural backgrounds creates a development team that has no divisions, operates transparently and is committed to creating value for the customer – the managers seek to be leaders and to transform their workplace into a Lean Enterprise.